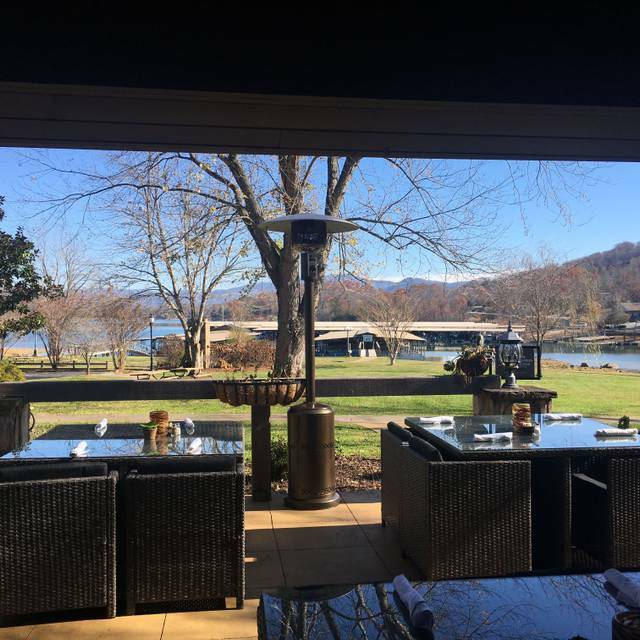 Located on the grounds of the breathtaking Ridges Resort on Lake Chatuge, The Oaks Lakeside Kitchen offers a scenic and sophisticated dining experience with plenty of Southern charm. This premier dining spot features an all-new menu with classic favorites, such as shrimp and grits with white wine-garlic sauce, and a fresh twist on more traditional dishes, like sweet tea-marinated fried chicken. All beef products are locally sourced, thanks to our partnership with Brasstown Beef. Stop in and try the Lake Chatuge Splash or the Blood Orange Manhattan while taking in the stunning natural beauty of the lower Blue Ridge Mountains. Come by The Oaks Lakeside Kitchen today for a taste of exceptional service, delectable fare, and a view you’ll never forget! Also enjoy our Specialty Appetizer Menu featuring chef’s choice items! Only available during happy hour and not on the regular menu! Very convenient location. Nice casual atmosphere. Good food. Good food, nice view - we were seated quickly and service was outstanding. Met friends and made friends for a perfect Thursday date night. We were staying at The Ridges and decided to dine at the restaurant to celebrate our Anniversary and V-Day. Needless to say I wasn’t impressed with my meal. My husband ordered the shrimp and grits and he said it was okay. I ordered the trout dish and it was the worst. The potato was hard and cold, the trout was tasteless. I was looking for to the trout because I thought it would be delish considering we were in trout country. Accompanied some friends to celebrate their anniversary. Food was good, not exceptional, and there was way too much pasta on the primavera plate. My friend noticed that he was charged $3 for his “rocks” twice! Really $3 for a few ice cubes????? I never saw that before. Overall it was a bit overpriced but we had a good evening so who’s fussing?!! Staff was friendly, helpful with selections, and generally nice. Nice restaurant with beautiful decor and views. Dinner was delicious, breakfast could use a little work. The Oaks Lakeside Kitchen was overall great! The food was really good and went with the value. The chef and serving staff were very friendly and helpful, however there was one female associate who appeared to be managing the reception areA who was very rude to myself and my party. She ruined what could have been a 5 star experience for no reason. She rolled her eyes and was very negative to my party but didn’t realize we were together and then treated us with the same attitude once we alerted her we were together. I would recommend having all staff members be as friendly as the chef and serving staff. First time here and the experience and food was wonderful. Our server Cameron really made our night wonderful. 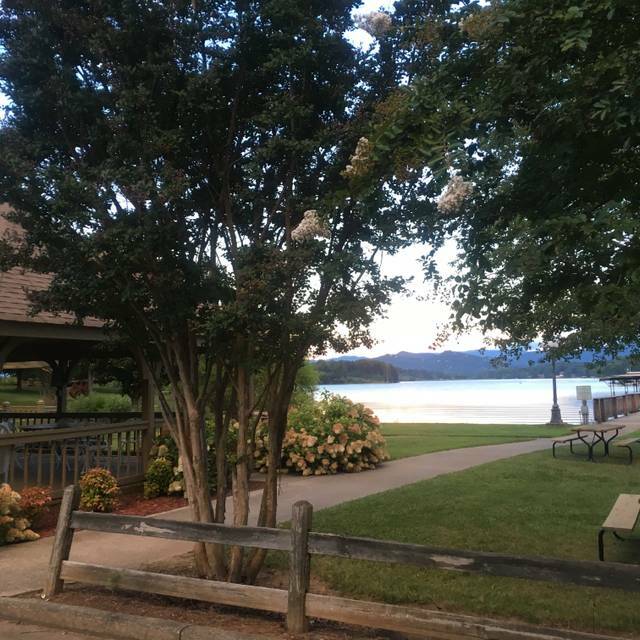 Looking to move to the beautiful Hiawassee/Hayesville area & wanted a 5 star evening out. Made reservations.....no need on a Friday night since the place was empty. Walked in to start with a frumpy hostess who couldn’t crack a smile, so that wasn’t very welcoming. The poor, timid waitress knew absolutely nothing about the wines & she tried to have the bar tender to come over to describe the wines, but he was as well, was unknowledgeable. We at least were offer samples. Dinner was a flop, totally unseasoned steak, bake potato was not warm throughout & the IHOP frozen butter I was given was a love too! Another couple was greeted by the chef & the manager, and with being the only other couple present, no one even noticed that we were there. Then the manager came out with wireless white earbuds around his neck to greet one table w/two ladies & then was chilling at the bar with patrons. Not very professional and extremely disappointed. Should have gone Zaxby’s for the quality & experience. Food was good but prices were high for amount of food. Drink prices were out of sight. Grilled cheese with soup $11.00, small glass mixed drink $13.00 some of the prices. Friendly staff and price was reasonable.. Atmosphere was rustic and warm.. The prime rib on New Year’s Eve was a great value. Neda (sp) did an exceptional job as our server. We will be back! The entire staff was very pleasant and the food was excellent. We're looking forward to visiting again. It was the worst Christmas Dinner we have had ever. Service was poor and mismanaged. And I was overcharged. We had a wonderful Christmas brunch with family. The view is incredible as well as the wait staff and friendly service. Thank you. We just celebrated our daughter's birthday there and loved everything about the place. We were 10, with late arrivers and one person that had to leave and return. The server and manager were very patient and helpful about these disruptions. The food...oh, the food...salads, steaks, shrimp, soup, club sandwiches and homemade chips...was fabulous. The lake view is breathtaking and the interior is classic and understated. This place has excellent food, wonderful staff, and a beautiful view. What else would you want? 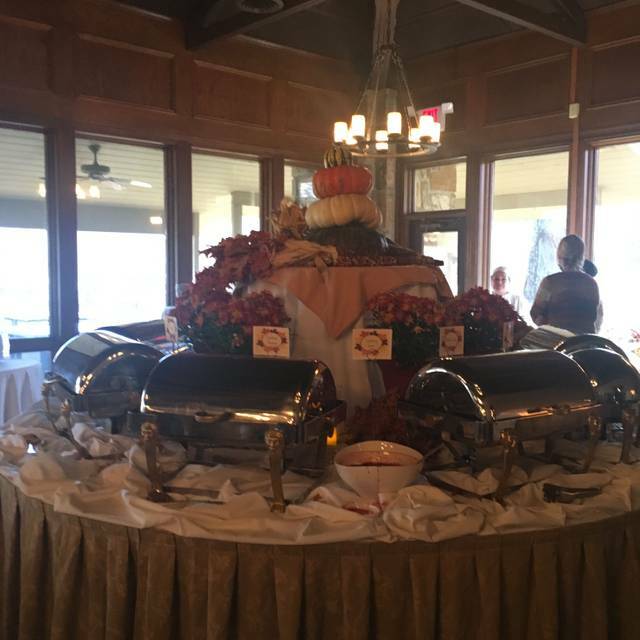 Great Thanksgiving Day buffet with outstanding service and attention. Would definitely recommend this place. Despite the big crowd, we were seated immediately after arriving, which was 15 minutes before the reservation. Thanks. It was ok. Nothing to brag about. Vegetables were very undercooked. The Thanksgiving buffet was delicious and we really enjoyed our meal. Service was attentive but not intrusive. Very disappointed! Been here several times! Always enjoyed the food and service! This time, service was abysmal, waited a good 10 minutes before anyone came over to take our drink order! The manager had to bring us water! Short staffed, bartender was also our wait person. Two more wait staff was working but apparently a waiting table didn’t seem to matter. The manager came over towards the end of our meal to apologize, but I am afraid at that point, I was over it. Too little too late! I am not saying I will not go back but if you want to be an upscale restaurant, you need to have service that goes with it. One more thing, why no bread before dinner. It’s your decision to not serve it, but most restaurants that I have been too that are ala cart will serve you bread. In addition, I did not see an option for a dinner salad. I might have glanced over it but there was no offer for it, nor were the specials ever mentioned to us. All in all, it was a major disappointment. Hi, my name is Damon. I'm the Restaurant Manager for the Oaks Lakeside Kitchen. First, thank you for your honest feedback. I apologize that your experience was anything less than spectacular. We clearly let you down and would love an opportunity to fix it. We served locally grown USDA choice sirloin, on that day. We apologize if you were led to believe otherwise. In addition, Au Jus will be served with all our freshly carved meats. Thank you again for dining with us, we hope to see you soon. The food is fair for the price and the servers and ambiance are the best of this place. Hi, My Name is Damon I am the Restaurant Manager for the Oaks Lakeside Kitchen. Thank you for taking the time to leave us a review. We are working diligently to improve our seating and service in our Bar/Lounge area. I hope to see you again soon so that we can deliver exceptional service. Great waitress, wonderful grilled cheese sandwiches on Sourdough with yummy tomato soup, it was perfect with a bottle of Butter Wine before a move on a chilly night! Hi, My name is Damon Latuch. I manage The Oaks. I'm glad you enjoyed your experience. We hope to see you again real soon. We went for Sunday Brunch. The selection was ok, not great. I thought for the variety of foods they had it was a bit overpriced. The cost was $20 a person plus the cost of a beverage and I feel it should have been more closer to a $12.95 breakfast buffet. There was nothing that expensive or special for the cost to be that high, per my opinion. Have been there many times for dinner and loved the food, and feel dinner is a better value. Went for Sunday brunch. Website stated that they offered both a buffet & menu items. Once there we were told that they only offered the buffet with an alleged chef manning a hot plate to cook omelets. Everything on the buffet was old, by appearance and taste. Never saw any of the staff checking the buffet items. Absolutely terrible. Nice view of the water and mountains. Friendly staff , good food and patio is dog friendly . Service was super slow and they added stuff on our bill like sodas we didn’t have . There was some mixup with our dessert order and had to wait long . Seems a little unorganized. The grilled cheese sandwich and tomatoes basil soup was good . Needs more staff for the patio . We came by boat. Great service, food, wine. Lovely setting outside. Will do it again. dinner was good... we actually went to here a lady sing in the bar area. She was excellent. We enjoyed our experience at the Oaks. We were celebrating our Anniversary and wanted a nice place for dinner. The restaurant was not crowded at 7:30. We had asked for an outside table when we made our reservation and was told the patio was first come first serve so we opted to set at the bar for a while to see if anything came open but didn't. The bar tender was very friendly and enjoyed talking with her. We did eat in the dining room which has a good view of the lake and the service was wonderful. We both had steak and it was very tender,juicy and cooked perfectly. Prices are reasonable for this type of restaurant. The waitress couldn't seem to remember what we ordered or what we asked for. A request for a straw went unheeded for 20 minutes until I went to the hostess and asked for a straw. I ordered she crab soup and was served mushroom soup. The green beans were hard as rocks. Our table ordered dessert and I asked for a cup of coffee. It never arrived and -- thankfully -- never made its way onto my bill. For diners looking for bland food and poor service, give The Oaks a try! We had reservations and had to wait for a table to be prepared. The tables were pulled together and weren't even the same size or height. It took 20 minutes for us to even have a waitress come take our drink orders. A manager came over during that time and said he just wanted us to know they hadn't forgot about us but then didn't offer to get anything for us. After placing our drink orders it took another 20 minutes to receive them and get our orders placed. This entire time I have a 4 and 6 year olds who are hungry and tired which is why I made a reservation for 6pm. When our appetizers came we had no plates for at least 10 minutes to eat them off of so the food was cold by the time we could really pass them around. The food and wine were very good but it was tainted by the service. We weren't the only ones experiencing this. One table by us left after not receiving service and another behind us complained multiple times. I would somewhat understand this if they were busy but it was reservation only night. They should have been more prepared. OK, so here it goes. The food was "good." All else, terrible. Let's start with a confused identity. This place is/could be a nice restaurant with tasteful decor and what could have been a great spot with a lot of potential. However, it is none of these things. Service was TERRIBLE. We saw our waiter one time. The music was so loud I could have smashed a glass against my own head and not heard it. Forget trying to have a conversation with someone inches from you. On top of that, the music was not even good. Think local garage band that may have memorized a few decent covers, but without any vocal ability, and now let's play that at ~200dB. Fun times. Skip this place. There are many better alternatives in the area. It was very hard to reach someone to take the reservation. I called several times 1 week in advance and left several messages for someone to please call me. No one ever did. I then submitted the reservation online 6 days in advance and made a special note for a table with a view of the lake for a party of 6. I finally got in touch with someone the day before our reservation to "make sure" that they did indeed receive it. They said they did have it. When we got to the restaurant they did not have a table with a view as requested. When ordering the meal the waitress took 2 of the 6 people's order and left and didn't come back. We had to find her to take the rest of the order. Very strange. Everyone's meal came out except for one which was delayed by quite a bit which made it awkward for everyone else. The actual meals were good. Several years ago this used to be a great restaurant, great chef, ambiance, view, service and decor and now it seems to be a struggle. After being closed for some time we went when they first opened again looking forward to the same experiences we had in the past and it couldn't compare. We were so disappointed. They ruined the decor, no lake seating outside and no view from inside and food was marginal. Would not go back but friends said that it had improved within the year so we gave it another try. It was better but not what it used to be. The question of would I recommend it to a friend was leaning towards "no" but I gave it a yes hoping that The Oaks will get it together. The corking fee was too high. The Five -Star restaurant, The Copper Door only charges $10 for a corking fee with a better wine & beer list. You need a better selection of wines and beers, so we don't have to bring our own wine in. Overall good food, they were out of the 2 appetizers we would have chosen which was interesting for a Saturday. At 630. Staff is good but everything is very slow.